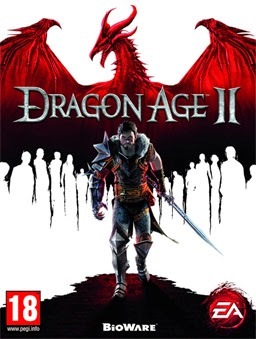 Gossamer Obsessions: Video Game Review: "Dragon Age II"
Well lookee here! Another videogame review! Don't worry - I'll go back to reviewing books relatively soon (including Ashes to Ashes and my reread of Prince of Midnight). So remember when I fangirled all over Dragon Age: Origins? Well, there's a sequel! And it's ... different. Still good! But very different, and different in a way that made some fans of the previous game pretty angry. However, I still really enjoyed it. The game's narrative is built around a storytelling framework: the cataclysmic events of the game have already happened, and one of your party members, a roguish teller-of-tales named Varric, has been captured by the authorities who want to find out what happened and the depth of your character's involvement. He essentially "narrates" the game. In a change that disappointed a lot of fans, you can only create your character to an extent. You can no longer choose your race or your backstory - instead, you are Hawke, a human whose family fled from Ferelden due to the Blight from the previous game (you can still choose your appearance, gender, class, and general personality, though). Your family washes up on the shores of Kirkwall, an independent city-state in the Free Marches. You escape being confined to the slums with the other refugees, but only by indenturing yourself in servitude to either a band of mercenaries or a band of smugglers (one of your first choices in the game). Before long your prowess as a problem solver gains you a reputation and more people in Kirkwall start coming to you for help and trusting your decisions. As you gain power and prestige, the problems you're expected to solve get understandably bigger. One aspect of the game that really rubbed some fans the wrong way was the setting - in the last game, your adventurers were able to traipse all over the nation of Ferelden - through forests and mountains and castles and caves. In Dragon Age: II, you're confined to the city of Kirkwall and a few locations immediately outside it. However, Kirkwall is no ordinary city. It's more like Sunnydale/the Hellmouth from Buffy the Vampire Slayer: a town whose grisly history of slavery and blood magic has made it a breeding ground for demons, corruption, and insanity. So Dragon Age: II has more of a noir feel to it, where even though the focus lies in one location, it's one with a lot of layers and context. That being said, I can understand how people got frustrated with retreading their steps through all the same places in the city, over and over again, or going to the same (or same-looking) caves again and again while completing different quests. While the setting we get is beautifully designed and rendered, that's really it. There's no sense of exploration or travel that there is with Dragon Age: Origins or Dragon Age: Inquisition. What Dragon Age II lacks in exploration, it makes up for in drama. Your Hawke and her family arrive in a city on the verge of a war from within. As explained in the previous game, mages in this world are able to tap into the magical power of the Fade (the otherworld), but it leaves them vulnerable to manipulation and possession by demons. Because of this, the Chantry (this world's version of the Catholic Church) decreed that all individuals with magical talents need to be taught in church-sanctioned Circles and guarded by Templars who are trained to take down any mage who looks too demony. Templars are also trained to hunt down apostates - mages who refuse the Circle system. But in Kirkwall, the system is broken, with mages and Templars at each others' throats. The mages say the Templars are magic-hating, civil-rights-violating religious zealots whose brutal tactics are driving mages to desperation. The Templars say that more mages are summoning demons and using blood magic than ever before, requiring stricter vigilance. Which side is right? Which side is the greater threat? There are a lot of different stories in the game as your pursue different quests, but the main conflict at the centre of Dragon Age: II is the growing Mage-Templar conflict and which side your character will eventually have to chose. Nowhere is the mage-versus-Templar debate more important than if you are a female Hawke! If you choose to play a female Hawke, your love interests lie on the polar opposite ends of the spectrum. On the one end is Fenris, a runaway elven slave with no memory of his former life thanks to the magical experimentation his mage owner subjected him to. He's very much a believer in "power corrupts" and that mages need to be kept on a leash for the greater good. On the other end is Anders, who believes Circles are prisons punishing innocent magic users for the crimes of a few. And whichever dude you choose, you can bet the other will have a few choice words regarding your decision. In fact, almost every one of the characters in your party will have a beef with one of the others. Your characters interact not only with you, but with each other, and not always in a friendly way. There are friendships, enmities, and awkward situations between the people in your party - and, as always, these reactions and situations are determined by the decisions that you make. I actually think Dragon Age: II's characters are far more memorable than a lot of the characters in Origins - I'm a particular fan of Captain Aveline, an arrow-straight warrior who grows into a capable authority figure, and Varric, a rakish dwarf-of-all-trades who starts chronicling your adventures. Also, Dragon Age: II improves on Origins' simplistic Approval friendship system by creating a Friend/Rival system - where, in certain situations, there's actually an advantage to certain characters disagreeing with you. Ultimately, while the setting leaves much to be desired, and certain aspects of the game feel rushed - the storytelling and the characters are top notch and still very enjoyable. If you're a fan of Origins' combat and exploration, Dragon Age: II might not be the game for you. However, if it's the story, the cinematics and the fantastic character interactions that drew you to Origins, Dragon Age: II more than delivers.